My scripture text is a favorite for many. It is Ecclesiastes 3:1-8 and on this New Year’s Day, I thought it would be appropriate to ponder its wisdom as it relates to our lives. For everything there is a season, and a time for every matter under heaven: 2 a time to be born, and a time to die; a time to plant, and a time to pluck up what is planted; 3 a time to kill, and a time to heal; a time to break down, and a time to build up; 4 a time to weep, and a time to laugh; a time to mourn, and a time to dance; 5 a time to throw away stones, and a time to gather stones together; a time to embrace, and a time to refrain from embracing; 6 a time to seek, and a time to lose; a time to keep, and a time to throw away; 7 a time to tear, and a time to sew; a time to keep silence, and a time to speak; 8a time to love, and a time to hate; a time for war, and a time for peace. I would like to look at half of the scripture verses and ponder its meaning as it pertains to our lives in 2017. Verse 2a: A time to be born and a time to die. The first things mentioned, the events of birth and death, are the two boundaries of life. The birth of a child is usually a joyous occasion, whereas death, in most cases, is unwelcome. Additionally, the perplexing questions of life and death are difficult to answer, such as the following: Why is it that a certain couple cannot have children? Why do good people die in the prime of life? Why did a tornado or a flood claim so many lives? Why do innocent people die in wars? I don’t think there are any answers that will satisfy, because the ways or acts of God are beyond comprehension. This may be hard for some, but the best we can do is accept that the Lord knows what is best and His will be done. Along these lines, earlier this week, I went into Burger King and got a hot coffee. When I looked at the sales receipt, I discovered that the clerk gave me a senior discount. That kind of threw me. All week long, I kept looking in the mirror to see how I look like a senior. It is inevitable that, though most will grow old, death is an appointment we all must keep. However, for Christian believers, we need not fear. In eternity, we will be with Jesus and God. For those who have not made a Christian profession of faith, I would encourage them to make peace with their maker. Verse 2b: A time to plant and a time to uproot. One talent that I do not have is the ability to grow things. I know how to use a chain saw and cut trees and trim bushes, but that talent of knowing how and when to bring something alive out of the ground is not my gift. I admire and appreciate those who have such a gift. I like to go into a garden shop where and look at the wide variety of plants, trees, and shrubs. One favorite spot of mine is Elizabeth Park in Hartford to see the all the roses. If we look at nature, we can get a general idea of how life works. Like Ecclesiastes tells us, there is a time to plant and a time to harvest. If we get the seasons out of sync or in reverse order, there could be trouble. The normal time to plant is in the spring and then we can enjoy the full bloom of pants and trees in the summer. In the fall we can see the beautiful foliage or the bounty of the farmer’s harvest. We can extend this principle to our own lives. If we live our lives and skip steps in the normal progression of life, there can be problems. Just as nature demonstrates, there is a proper season or way we should do things. Verse 3: A time to kill and a time to heal. Youth is the time of growth. Muscles and abilities increase and coordination only gets better. As grandparents of 2 year old Anthony, we can see the amazing process of growth; it is a pleasure to watch. In time I expect that our grandson will surpass us in height, strength and athletic ability. As we get older, our bodies will begin to break down. The letters and numbers on the computer screens or cell phone will get smaller and smaller. The steps on the stairs will get higher and higher and we will find that people will speak in lower and lower tones. Even as it is normal to age, we should do everything in our part to seek healing and improve the quality of life whenever we can. But there will come a time when each of us will need to let go and be ready to go into eternity. The Christian believer who walks daily with the Lord, knows that when it is our time to leave this life, we will receive our eternal reward. Verse 4: A time to weep and a time to laugh; a time to mourn and a time to dance. John Locke, the English philosopher once said: “If you dig far enough into the earth, you can come to water. If you bore deep enough into life, you come to tears.” In this imperfect world, we will experience sorrow; it is during those difficult times we will need the support of others and the comfort of God’s presence. Through the healing of time, we will once again be able to laugh and be content. Verse 5: A time to embrace and a time to refrain from embracing. A young couple from New England had just become engaged when the Civil War broke out. The young woman’s fiancé was called into the army, so their wedding had to be postponed. The young soldier had managed to get through most of the war without injury, but at the Battle of the Wilderness, he was severely wounded. His bride-to-be, not knowing of his physical condition, read and reread the soldier’s letters, counting the days when he would return. Suddenly the letters stopped. Finally she received one, but it was written in an unfamiliar handwriting. It read: “There has been another terrible battle. It is very difficult for me to tell you this, but I have lost both arms. I cannot write myself, so a friend is writing this letter for me. While you are as dear to me as ever, I feel I should release you from the obligation of our engagement.” That letter was never answered. Instead, the young woman took the next train and went directly to the military hospital where she found her loved one. The moment she saw him, she threw her arms around his neck, kissed him, and said, “I will never give you up. These hands of mine will help you. I will take care of you.” That is truly an inspirational story. Unfortunately there are sad situations on the opposite spectrum. When I was in Physical Therapy training in San Antonio, Texas, several of our instructors told us about the times that certain spouses would go into the Burn Center, take one look at their loved one, take off their wedding ring, leave it on the night stand and walk out. After that emotional traumatic event, some of the patients gave up the will to live and died. Let me be positive about the spirit of Ecclesiastes, there will be times when it is appropriate to embrace others and show them our support. Mrs. Phyllis King believes this with all her heart and she makes certain that everyone who walks through the door of this church feels welcome. And then there will be times, depending on the circumstance or situation that we may need to keep our distance; that calls for discernment as well. Verse 6: A time to keep and a time to throw away. Let me extend this to another realm. We need nurture friendships, good relationships and wonderful memories; and throw out any resentments, anger, long standing hurts. This morning I covered half of the verses from Ecclesiastes; they are a good reminder of what we could face in 2017. In our life’s journey, we will face many new situations, and we will experience both joys and sorrows. It was Christmas Eve 1914; soldiers from the German and English armies had fought for 5 months in the First World War. Both sides were in a stalemate as they shivered in the water logged trenches. In response, the soldiers of the London Rifle Brigade cheered and they in turn sang “The First Noel.” For over an hour, German and English soldiers in opposing trenches sang carols. In between songs, there were calls for each side to come over and visit, but no one dared to make a move. Finally on Christmas morning, German soldiers, with hands in their pockets, came out of the trenches. British soldiers did the same. They greeted one another and shook hands, and peace had begun to spread through that no man’s land. They all promised to keep the unofficial ceasefire throughout the day. It was truly an incredible sight as a multitude of soldiers walked arm in arm and took photographs. Several soccer matches with tin cans were played, and if a man got knocked down, the other side helped him up. All during the day, soldiers paid mutual trench visits and exchanged gifts of tobacco, jam, sausage, and chocolate. They traded names and addresses. An English barber gave free haircuts while a juggler from the German side entertained the troops. Soldiers from both countries respectfully dug graves side by side and held joint funerals. However Christmas 1914 will always be remembered as the time in history of the most famous military truce. It was even made into a movie called the “Joyeux Noelle.” That extraordinary event illustrates the powerful effect Christ has on history. So tonight on this Christmas Eve, this is truly a time for the heart, more so than for the mind. 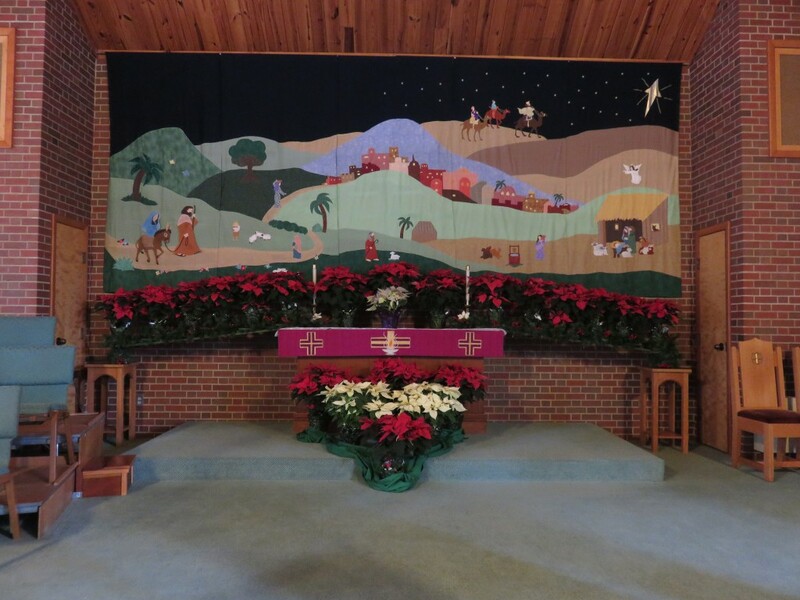 In our worship service we have images of the Nativity through the tapestry on the wall, the songs, and the videos that remind us of what happened. There is the bright star that shines in the East that leads the wise men to Bethlehem; there is the heavenly host that sings praises to God to the fear and amazement of the shepherds and finally there was the special baby boy who was born in a stable wrapped in swaddling cloth, cared for by Mary and Joseph. Tonight, we come, not necessarily wanting to hear the proofs and reasons for some great truth or mystery of God. We want to feel and experience the warmth, love, softness and wonder of God that is with and among us. This is a night where we want to feel what we believe: to celebrate the birth, not only of a wise man, a great teacher, a prophet, but of God in the flesh in the form of a baby. In a few hours, families and friends will exchange gifts, but perhaps the best Christmas present we can give ourselves is to invite Christ into our hearts and live for him. Someday this little baby who grew up to be a man, will return as the Prince of Peace, and what happened on Christmas of 1914, will be like a foreshadow of greater things to come. So in the meantime, let us keep Christ in our hearts, not only during this Christmas season, but every day of the year.